Ever wonder what goes on behind the scenes in the campaign to win approval for a 48 million ton coal export terminal at Cherry Point? Many of those efforts are not in view of the public, but can come to light via public records requests related to various components of the proposed Gateway Pacific Terminal (GPT) project. Public records requests placed to the Ferndale School District and the City of Ferndale government and staff relating to GPT provided the opportunity to review records that revealed some interesting information. One of the avid GPT promoters (shall we say pro-GPT activists?) listed above, Ken Oplinger, sent an email letter dated June 21, 2012 to Ferndale School District Superintendent Linda Quinn. 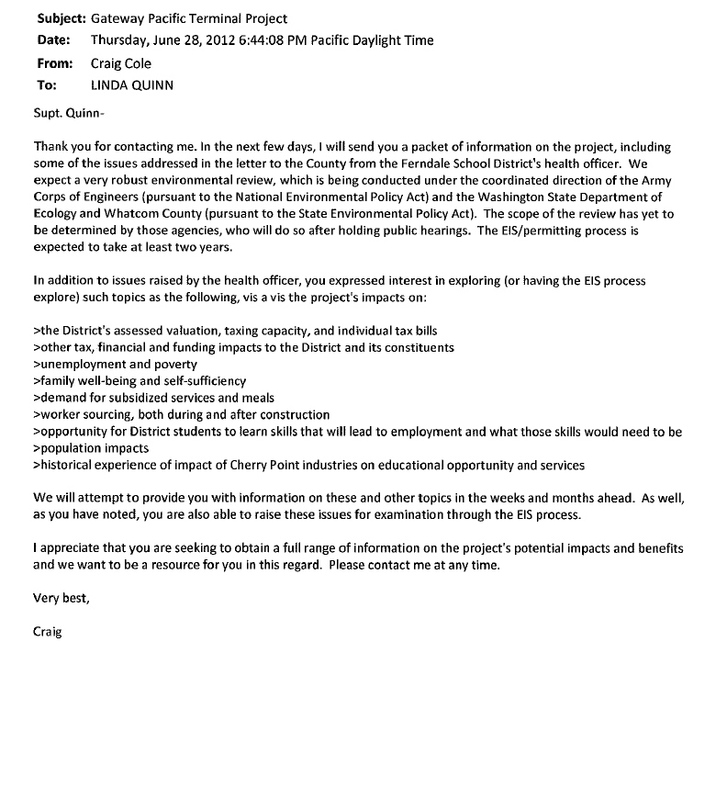 The subject of Oplinger’s email letter was a May 8, 2012 letter written by then-School Health Officer and Director of Special Services for Ferndale School District Dr. Michael Berres, Ph.D, sent to Tyler Schroeder, then-Planning Manager at Whatcom County Planning and Development Services (PDS). Whatcom PDS is one of the co-lead agencies for the State Environmental Policy Act (SEPA) review of the proposed GPT project. 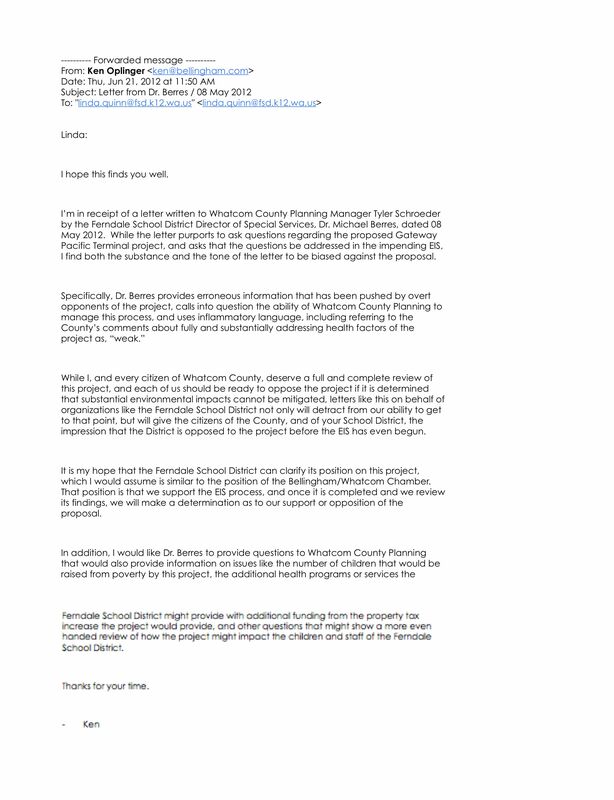 Dr. Berres’ letter contained questions about potential health impacts to Ferndale School District students which could result from the proposed GPT project if it were built. Oplinger also claimed that Dr. Berres provided “erroneous information that has been pitched by overt opponents of the project,” in his letter. There were no specifics provided by Oplinger as to what he considered erroneous, nor any evidence to support that general claim. In further examining the records, it turns out that Oplinger was not the only person contacting Ferndale School District about Dr. Berres’ letter to PDS. 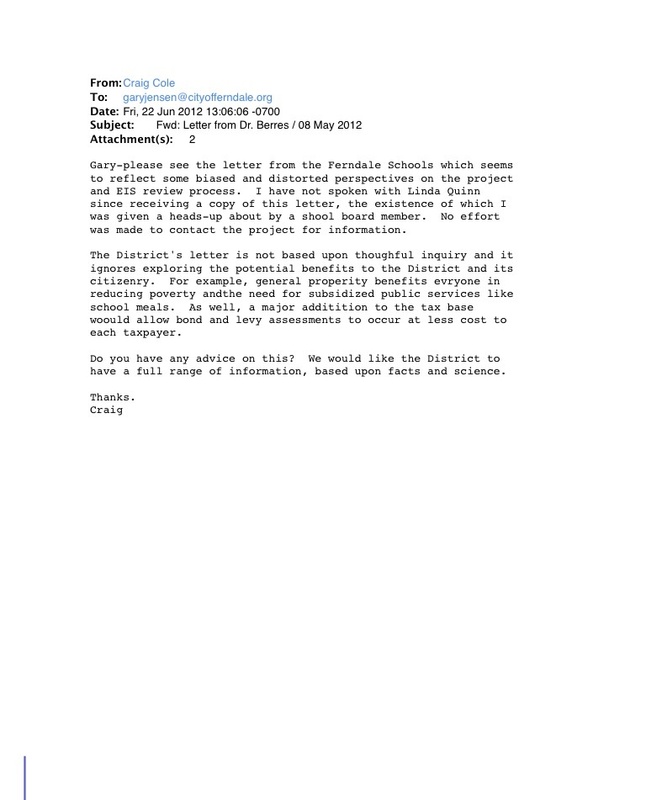 In a June 25, 2012 email from Dr. Berres to Superintendent Quinn, Dr. Berres had prepared a sample draft response for Ms. Quinn to send Oplinger. 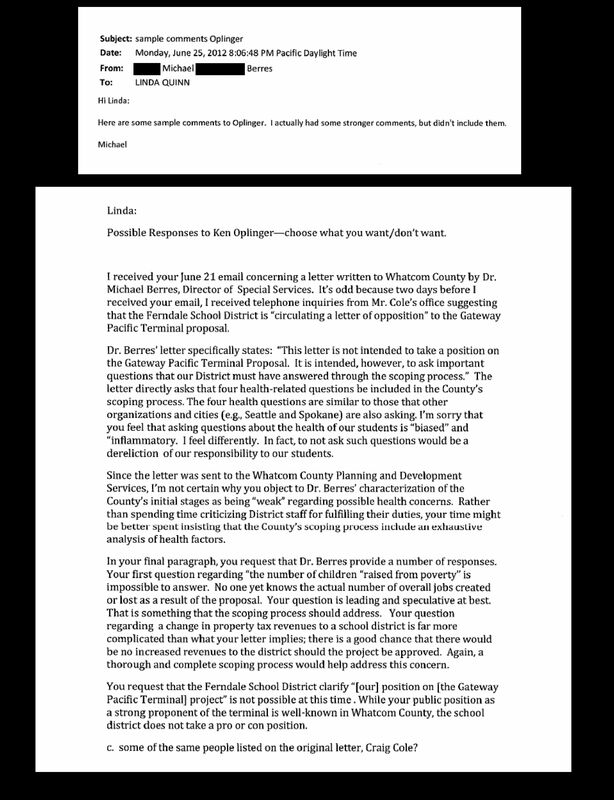 Why did Ken Oplinger feel it his place to contact the Ferndale School District, criticizing Dr. Berres’ letter to Whatcom PDS, and requesting that particular additional information about GPT should be included in Dr. Berres’ letter to PDS? 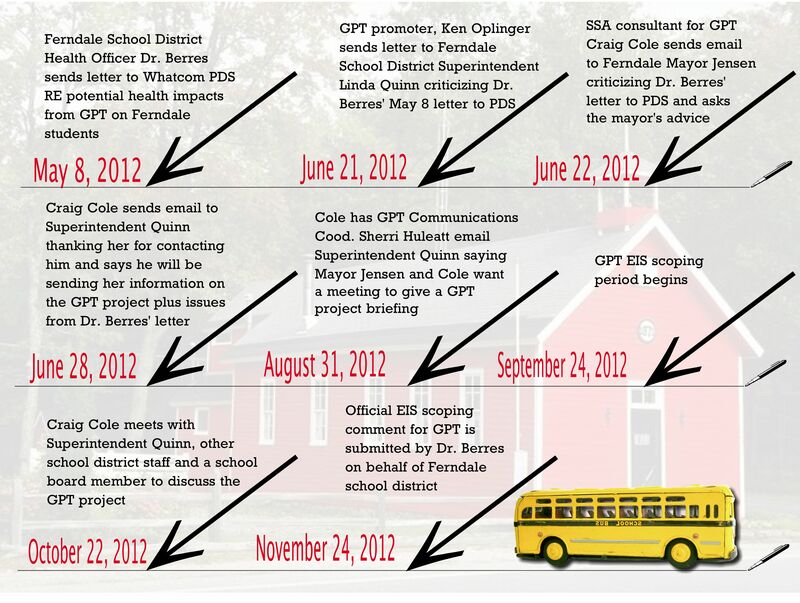 If Cole “was given a heads-up” by a Ferndale School Board Member, why was a school board member alerting SSA/GPT consultant Cole about the existence of Dr. Berres’ letter? Cole closed his email, asking Mayor Jensen if he had any advice on this matter, saying that they [SSA/Cole] would like the district to have a full range of information, “based on facts and science.” Mayor Jensen responded the next day in an email saying he was out of the country and when he returned after July 5, he would talk with Cole, and then with Linda Quinn. One week later, according to a June 29, 2012 email from Cole to Mayor Jensen, Cole told the mayor he had a conversation with Superintendent Quinn. If, in fact, Cole expected a very robust environmental review, then why is Cole questioning anything that Dr. Berres wrote in his letter to Whatcom PDS? 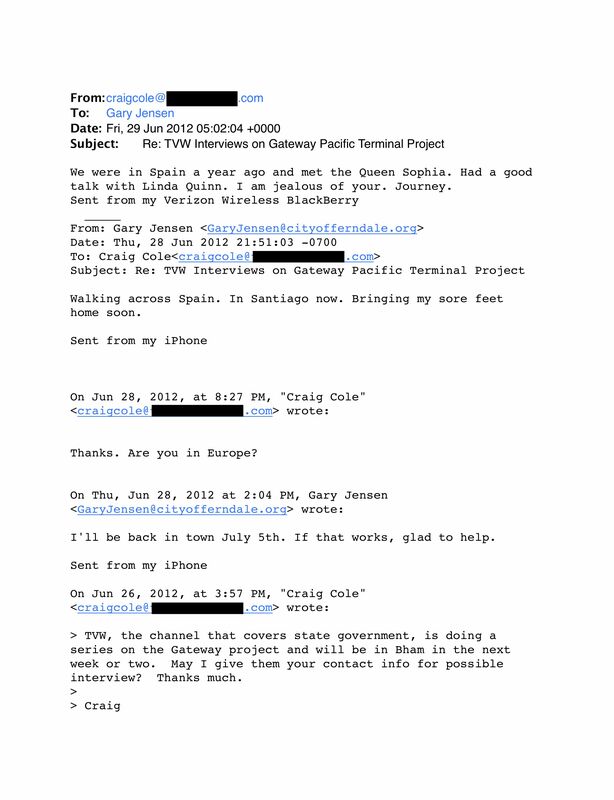 One month later, on August 31, 2012, Cole sent an email to Sherri Huleatt, GPT Communications Coordinator who worked with him, asking her: “Could you see if Gary would be willing to host a meeting with the three of us to provide Quinn with an intro to the project?” That same day, Sherri Huleatt sent an email to Ms. Quinn, saying that Mayor Jensen is hoping to schedule a meeting along with Cole in order to give Ms. Quinn “a briefing” on GPT and answer any questions she may have about the project. According to email records, on October 22, 2012, Superintendent Quinn, Ferndale School District President Lee Anne Riddle, Ferndale School District Assistant Superintendent for Business & Support Services Mark Deebach, and Ferndale School Board member Hugh Foulke met with Craig Cole. Cole had initiated the meeting to provide the school district information about the potential impact on the tax base in Ferndale from GPT project. This meeting was approximately one month prior to Ferndale School District’s November 24, 2012 EIS scoping comment submission for the GPT project. In reviewing Dr. Berres’ May 8, 2012 letter to Whatcom PDS, his approach seems to be one of laying a foundation for each of the school district’s questions and then posing those questions about the potential adverse impacts and health effects to Ferndale students; in other words he was providing the reasons why the questions he was asking the agencies (tasked with the environmental review for the proposed GPT) mattered to the students, teachers and parents in the Ferndale School District. The importance of the foundation laid for questions and concerns in scoping comments submitted for the Environmental Impact Statement (EIS) for GPT is evidenced when reading through scoping comments entered into the EIS record. For example, the small city mayors of Whatcom County submitted an EIS scoping comment for the proposed GPT on November 29, 2012 which all the six small city mayors signed, and which Lynden Mayor Scott Korthuis delivered verbally in the public testimony period that same day at the Ferndale EIS scoping hearing. That comment included information explaining the significance of why they were asking for their particular remarks to be considered. Those remarks related to economics, industry, jobs, wages, etc. There were no specific questions in their scoping comment asking the EIS agencies to consider the reasonably foreseeable and/or potential adverse health and environmental impacts from GPT on the communities which the mayors serve. 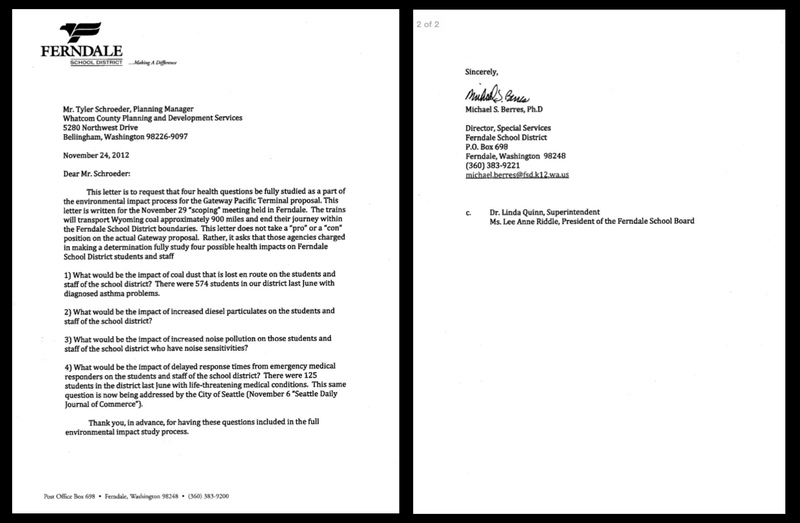 Dr. Berres then asked four questions to PDS in his May 8, 2012 letter. The questions all had background details showing the reasoning as to why Dr. Berres posed those questions. 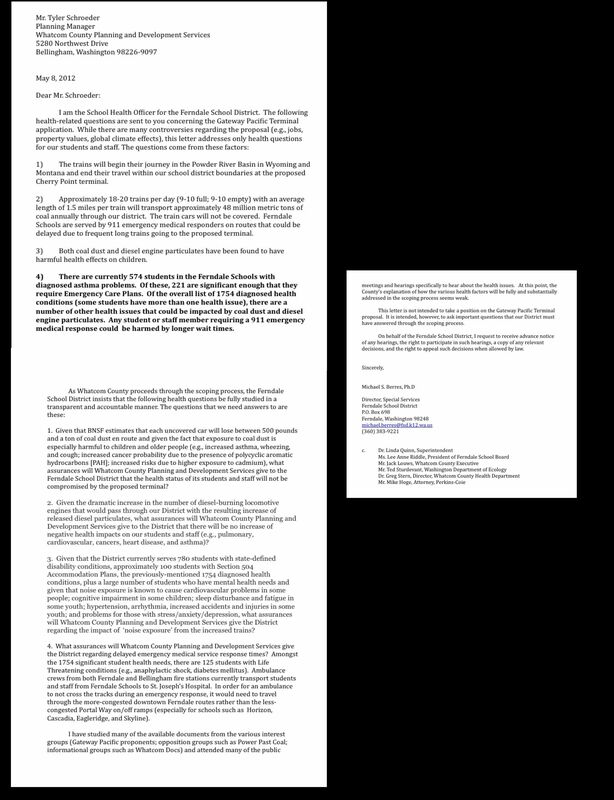 Comparing the Ferndale School District’s official November 24, 2012 EIS scoping comment for GPT to the May 8, 2012 letter Dr. Berres sent to Whatcom PDS, the differences are very noticeable. Almost all of the foundation from those original four questions is missing in the school district’s November 24, 2012 EIS comment. What is unknown is why that happened. What I find fascinating is that GPT proponents get bent out of shape when someone opposes the project, calling them biased and in the same breath is on a first name basis (e.g. Craig to Gary), requests interviews of support and have individuals in prominent positions voicing support for the project. They also don’t seem to be the least bit concerned with defaming anyone else’s character but threaten legal action when someone questions the integrity of theirs. They also seem to support the EIS process and at the same time are trying to circumvent it. Sigh . . . Unfortunately, they have been and will continue to wine and dine, wheel and deal with lots more folks. We know that. This is just a good reminder for us not to get overconfident, nor place any trust in any trust in a process we know to be skewed in their favor. dcruz: Yes, it’s a one-way street for GPT proponents in terms of bias such as pro-GPT promoter Hugh Foulke, a Ferndale School District Board Member, who has spoken publicly in support of GPT. His pro-GPT video on YouTube and his photo were used in various ads for GPT. It would be fine for him to publicly support GPT, as he is entitled to his opinion–except for the fact that I do not believe he was/is entitled to state that he is a Ferndale School Board member before giving his public statements in support of GPT, because that could imply he is speaking for the school board. I contacted the Ferndale School District Superintendent about Foulke in Jan 2013, but was told they could not really do anything about it. I reminded them that they have a code of ethics for school board members which I looked up, but they told me that was more of a “gentleman’s agreement.” I went to two of the school board district meetings and made public comments about Foulke doing this to get it on record. 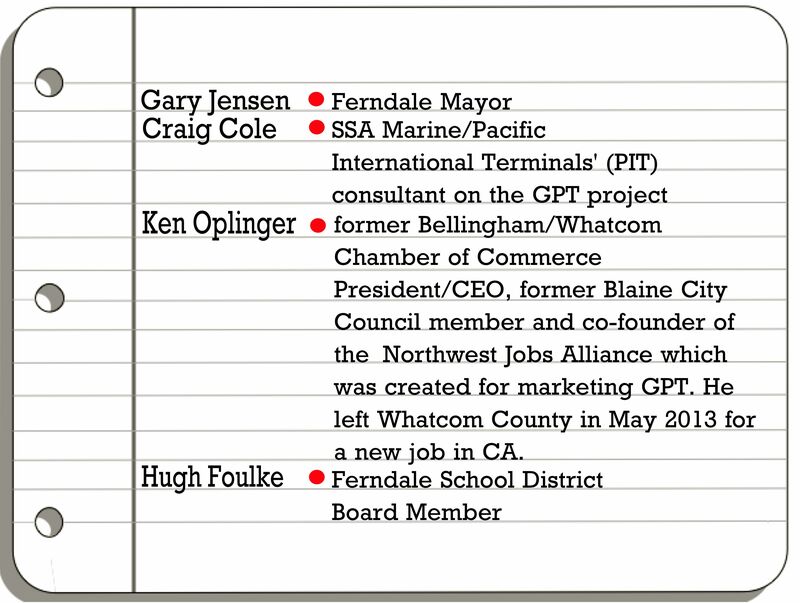 I found it particularly inappropriate that Foulke was publicly supporting GPT as he was also identifying himself as a Ferndale School Board member while making those support statements because many of the students from the Ferndale School District are from the Lummi Nation. It seems insensitive for a school board member to publicly endorse a 48 million ton coal terminal which, if built, stands to seriously adversely impact the Lummi people and their sacred lands and waters–and when the Lummi Nation has stated they are unequivocally opposed to the proposed GPT. 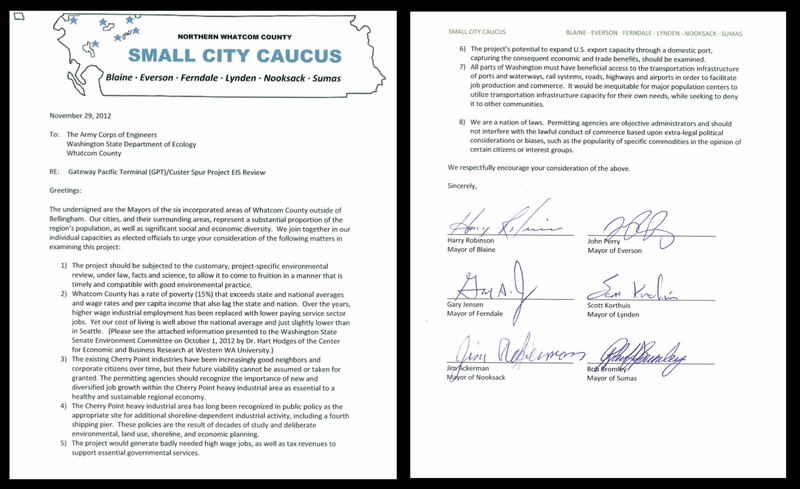 GPT proponents also have no problem with bias when they use Mayor Jensen in pro-GPT ads or with the Op-Eds he wrote; they have no problem with all six of the small city mayors signing and jointly submitting an EIS comment on GPT supporting the project and stating that the proposed project should be limited to a “project-specific environmental review;” and they have no problem with the Ferndale city council passing a resolution in support of SSA’s project. The list could go on as those are but just a few examples. When local newspapers lack the staff or resolve to do this type of investigative journalism, the community suffers. We are fortunate to have in our midst Sandy Robson and so many other concerned citizens volunteering to inform our communities about GPT and other potentially hazardous proposals. Certainly this eye-opening article would be of high interest to everyone in Ferndale who cares more about their children than they do about the political or monetary fortunes of GPT proponents. Sandy’s article deserves to be widely distributed especially to those living within the Ferndale School District.